Forget Peter Jackson. Forget Elijah Wood. Forget comically awful CGI elephants and parkour-gifted elves. Instead feast your eyes on Ralph Bakshi‘s glorious animated failure from the fag end of the counter-culture revolution, ‘The Lord of the Rings’. Okay, how can you have a glorious failure, you ask? Well, that is what happens when you take one of the greatest Fantasy stories in literature and spend two years squeezing the first two books of a hefty trilogy into a 133 minute animated version using innovative film techniques, release it to the general public with the promise of a culminating sequel, and then falter exhaustedly at the markedly mixed reactions from audiences and critics alike. A failure, yes, but what a failure. In fact the movie recouped its budget several times over following its premier in 1978, and most observers regarded it as a flawed but well-intentioned effort to bring to the big screen a fictional work many believed could never be given cinematic form. 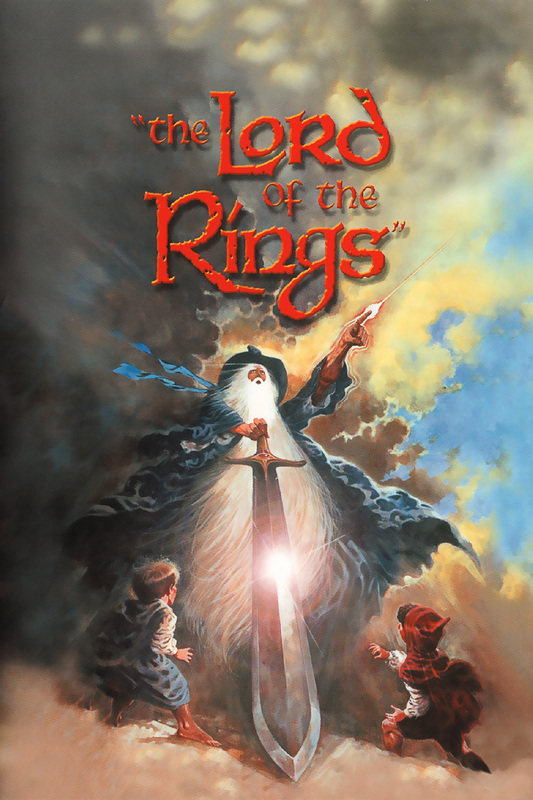 However the effort and strain of producing a composite version of the first two titles in the Lord of the Rings series nearly broke Bakshi, financially and otherwise, and he never returned to the project, concentrating instead on more personal films before taking another stab at the Fantasy genre in 1983 with the lamentably poor ‘Fire and Ice‘. Which is truly a shame. Despite all its problems, its veering away from the original source materials, its compressing of the storyline and editing out of key sections, the 1978 version of Tolkien’s epic remains an imaginative and enjoyable vision of Middle-earth by an animator at the height of his success. The movie simply looks beautiful with lushly drawn landscapes and interiors that are a feast for the eye. The characters are artistically realised and distinctive, animated with a real-life verve. The voicing is pitch perfect, with a host of notable British actors and actresses contributing some fine performances. Yes there are a few fumbles or quibbles (not least the infamous tendency to pronounce ‘Saruman’ as ‘Aruman’ due to the interference of some micro-managing studio executives) but otherwise the positives outweigh the negatives. The music too deserves a special mention being far and above the average animated sound track, the result of proper orchestration and direction. Some of the more unusual animated techniques, in particular the rotoscope effect where real persons were filmed and then carefully drawn over, work surprisingly well, despite the criticisms of the animation purists. In some scenes, particularly those featuring the Black Riders, the figures are undoubtedly rendered more lifelike – and in this case, sinister – than any traditional techniques could have achieved. However this only added to the cost and labour of what became an exhausting movie to produce for all involved (it should be noted that a young Tim Burton was one of the animators). Though initially denying any inspiration from Bakshi’s movie Peter Jackson did later admit that the 1970s’ version was the cinematic source for his own later (and much more famous and successful) live-action ‘Lord of the Rings’ epic. In fact he saw the film long before he read the Tolkien books – which some might say explains a lot. Today Ralph Bakshi’s Middle-earth interpretation is regarded as one of the better and more innovative animated movies of the last forty years and despite the animosity of some people in contemporary fandom, its standing has grown, not diminished since its original release.